The Indonesian PR Practitioners Group, an informal gathering of consultancy and in-house PR pracitioners from several agencies and corporations, are organizing the first of a series of workshops aimed at raising the professional bar for the PR industry here. 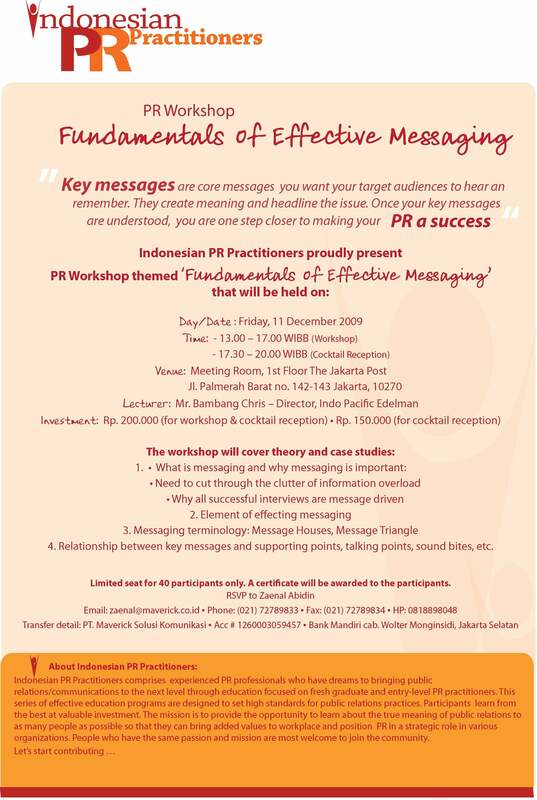 The workshop is on the “Fundamentals of Effective Messaging” and it will be held two Fridays from today at The Jakarta Post, whose CEP Daniel Rembeth has kindly made available to the group. The workshop will be followed by a cocktail reception where the newer members of the profession can mingle and network with the more senior ones. For more details of the workshop go to this link or contact Dian Noeh Abubakar of Weber Shandwick who’s the chairperson for the workshops. But if you’re interested in attending the workshop please hurry in registering yourself. There are 40 places and already, as of this afternoon, 27 people have registered. Twitter journalism on suicide deaths a danger?